Here's what I'm working on at the moment, fifi the butterfly doll. 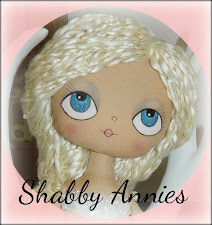 Its the same doll pattern as my current dollis. I am having so much fun with this pattern and have heaps more ideas coming. I started off with calico then painted almost all of the body and head bar the face, then in my delayed wisdom realised It'd be much easier to make the body out of a printed striped fabric then just paint the face antique white!! But its all part of the process - I love working on proto-types! It has been slow going though as I have been a bit under the weather - the cooler days are creeping in. Still not sure if I'll put dolls hair on or antennae?? And legs all 6 of them - color to be black, maroon, cream, green??? still working on it, will post some more pics soon. She is going to be very cute. Tuft of hair with antennae and maroon legs maybe? That sounds good! My husband thought maroon legs too - so the votes have it! Thanks. She is looking great...everyone said to say hello and catch you when you are up to coming to Cackle Club again...it is not on next week due to almost everyone being away...can't wait to see this girl finished. I can't wait to get to cackle club again - I had such a lovely time, what a great bunch of crafty ladies. Just have to think of a cute name for her! p.s. Did you ever end up doing anything with that lovely chenille you bought? I'll take a trip back in your posts and see if I can find anything about it.